This item comes with 50 pre-cut mats, 50 backing boards and 50 clear bags. The mat opening size is 7.5"x9.5" for 8x10 print. The mats are beveled cut. The backing board is 4-ply, white on both sides. The re-sealable adhesive strip of the clear bag is below the opening of the bag instead of on the flap. Our acid-free whitecore matboards are a 4-ply papermat that provide the aesthetic and design benefits of a bright white bevel. 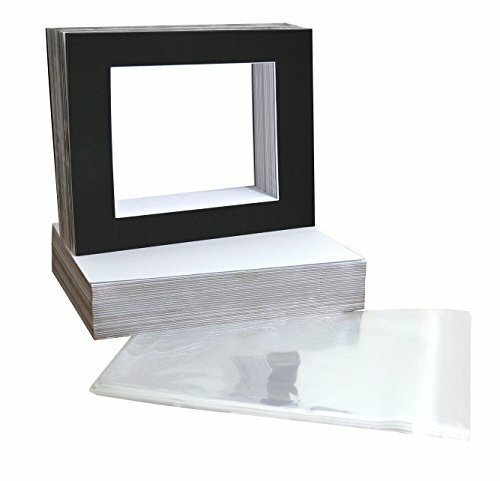 It can be used for matting photos, art, and needlepoint. Also great for crafts, backboards, signs, children's projects, and school projects. This item comes with the 50 pre-cut mats, 50 backing boards and 50 clear bags. The mats are beveled cut with white core and 4-ply thick (about 1.4 mm or 1/16 inch). The backing board is white on both sides.